Awesome hostel! The hostess was very friendly told me everything to do in Split, including where to eat, where to get groceries, green spaces, muesums and things to do outside of Split. Aaand they have a fully functioning disco ball right in the room. Receptionist was amazing, went out of her way to make sure I enjoyed my stay. She spent like an hour going over a map with me. Apartment was fantastic and had a frickin disco ball. I stayed at the deluxe tower. It is great. Great location and facilities. 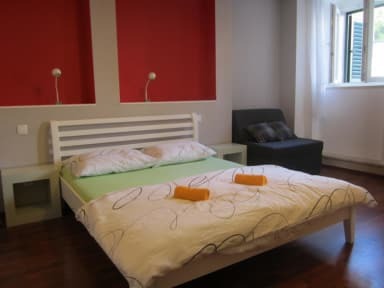 Great hostel in Split! The location is great, only five minutes from the city center. The receptionist went above and beyond to help us, she set up a tour for us and gave us a detailed map of all the best things to do/places to eat in Split. Highly recommend. Helpful staff. Allowed me to check in really early by upgrading my room. Also shared lots of info about what to do around the area. Privacy is good. Near to the ferry and bus stations. Short walk to the palace. Perfect location to access the beach and the palace, rooms were clean and staff were friendly. Really beautiful apartment, very clean. Check in was in a different location which was a bit confusing, especially with a suitcase. The staff member I spoke to was very helpful. Location is really good for both the ferries and the airport bus. A nice craft beer pub steps away. Not ideal if you are wanting to mix with other guests, but perfect for me as I wanted to just sleep before an early morning flight. Really appreciated the apartment for my final night in Split! Location is perfect, in the neighbourhood with lots of trendy restaurants, and a stone's throw from the old city. It's also a short walk to the port and bus terminal and beach. I rented an apartment so there wasn't any 'atmosphere', if you are looking for privacy this place is great. Staff was friendly and accommodating.